An Italian scholar and editor of scientific works; lived at the end of the sixteenth century. He edited the work "Meharere Nemerim" (Venice, 1599), a collection of several methodological essays and commentaries on various Talmudic treatises. Akra is the author of a methodological treatise on the Midrash Rabbot, which Isaiah Horwitz ( ) embodied in his work "Shene Luḥot ha-Berit" (ed. Amsterdam, p. 411), without credit. The same thing occurs in the Wilna edition of the Midrash Rabbot, where Akra's treatise is reproduced from the "Shene Luḥot ha-Berit." Akra's work appeared originally as an appendix to the "Arze Lebanon," a collection of cabalistic essays, Venice, 1601. 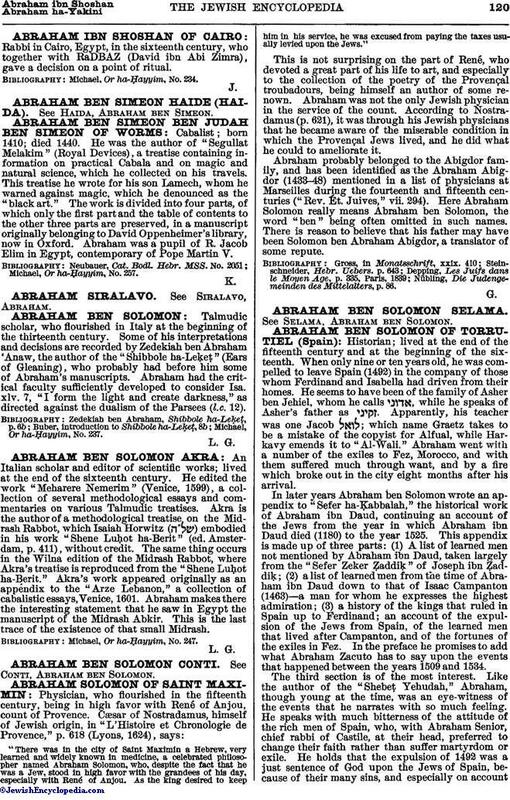 Abraham makes there the interesting statement that he saw in Egypt the manuscript of the Midrash Abkir. This is the last trace of the existence of that small Midrash. Michael, Or ha-Ḥayyim, No. 247.